Fawzi Karim was born in Baghdad in 1945, and now lives in London. 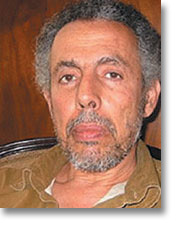 His poetry collections in Arabic include: The Foundling Years (2003); Selected Poems (2004); The Last Gypsies (2005) and The Night of Abel alaa (2008). His first collection to be published in French, Continent de Douleurs, appeared from Editions Empreintes in 2003. Plague Lands, his first collection to be published in the United Kingdom, and translated by Anthony Howell, is due from Carcanet Press in 2011.